HyeDroid clients range form small to medium to large organisations in Australia. In the constantly evolving world wide web, we constantly work with businesses to make the system better, smarter, more robust, secure and up to the latest standards and specifc business need. 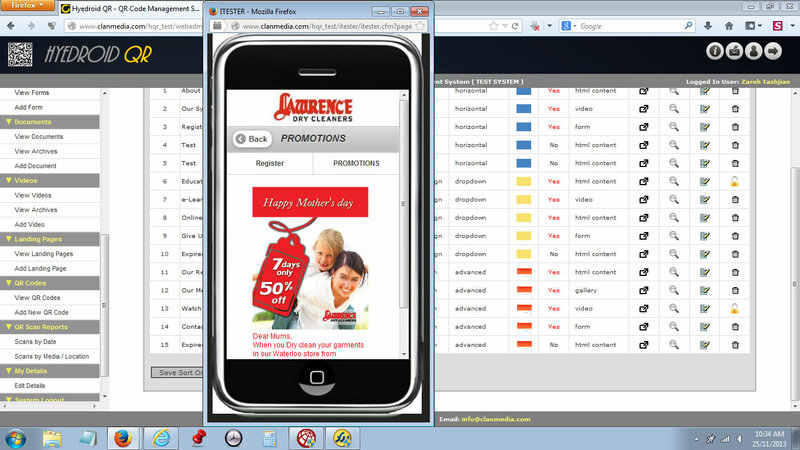 Lawrence Dry Cleaners Mobile Campaigns - A mobile QR code campaign management system using the HyeDroid QR platform. Lawrence Dry Cleaners in NSW can visually create mobile campaigns and mobile optimised landing pages featuring videos, surveys, competitions, documents, content pages and image galleries. All can be visually built fast via HyeDroid QR. All QR codes are automatically generated. QR Code management and tracking system. The system allows users to import and manage thousands of QR Codes. Location and city based tracking, scan reports for each QR Code. Export tracking data in multiple file formats and HQ PNG / PDF files. Penguin Limousines - An online limousines booking system. Users can book a limousine online via a secure booking form. An online database and a custom administration system is integrated with the website to manage the bookings, communicate with the clients and manage everything anytime and anywhere. An Australian mobile shopping cart system, QR Code based and integrated with PayPal, optimised for smartphones. An adminstration system to create all the products, mobile optimised landing pages and related QR codes. Custom web development business mobile site and advertising campaigns via QR Codes and NFC tags.